As Enfys, the PHP Diversity Elephpant, I try to promote Diversity and Inclusivity within the PHP Community, and those Communities based around PHP products like WordPress, Symfony and Drupal. I believe that Inclusivity is a moral imperative, as well as beneficial to the Community as a whole. I believe in actively promoting Inclusivity and Diversity within a Community, and that as the Community recognises the benefits, then it will change for the better; but I also recognise that there are toxic individuals who will always resist that change (“Haters gotta hate”), and that there are times when it is necessary to be proactive. A good Code of Conduct is one way of being proactive, especially if it is clearly enforced, so I’m always pleased to see Communities with a public Code of Conduct as a sign that they are Inclusive and welcoming to everybody. This time next week, I’ll be freshly returned home from the PHPBenelux Conference in Antwerp; then 2 weeks later I’ll be getting myself ready for the PHPUK Conference in London. There are a lot of benefits to attending conferences: I always feel invigorated and enthused after spending time at a conference; I learn a great deal from the talks and from the “hallway track” (just talking with other developers); it can provide new job opportunities (I hope it does this time, because I’m looking for a new role); and it’s also good to meet up with old friends and make new friends within the PHP Community. I’ve been thinking about the diversity of attendees at PHP conferences for a while, and started putting the notes together that form the basis of this post last Summer; so it really is time that I completed the article and published it. 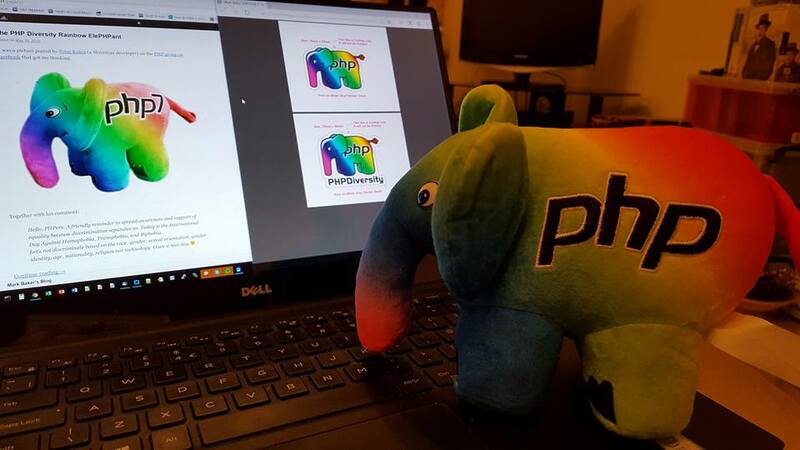 It’s been a long, slow, lazy summer; but it feels as though things are accelerating in my life at the moment as we approach the launch of the PHPDiversity kickstarter. Mark promised himself that he wouldn’t proceed until he had all the costs associated with making me a reality (and knew that I was financially viable), and until he’d held the prototype me in his hands (rather than simply seen photographs of me) to assess that I really was what he’d expected. Well, he’s been able to put those final figures into his spreadsheets now; and the prototype me is on its way to him even as I type. Assuming that it matches his expectations, he reckons that the kickstarter to make me real will launch toward the end of this month (October) or early November at the latest.